According to the Headquarters Gazette for January 1911, the 2nd Christchurch Troop was opened between November and December 1910 with Scoutmaster R. Church, Assistant Scoutmaster Cox and 16 Scouts and in the Headquarters Gazette for March 1911 it stated that the 7th Christchurch (Cottage Homes) was opened between January and February 1911 with 24 Scouts and Mr R. Blakeborough as Scoutmaster (He was also Superintendent of the Cottage Homes). The Cottage Homes was a children’s home that housed, on average, about 70 children. It was situated opposite the hospital where Bronte Avenue and the Old Peoples’ Homes now stand. It stretched for about 190 yards along the Fairmile Road and for about 150 yards away from the road. In the centre was a “green” about the size of a football pitch and all around that ran a small road. There were six large houses where the children lived, three on each side of the “green” with a school building or hall along the end furthest from Fairmile Road. Just inside the entrance gate on the left stood the Superintendent’s house. At the time that Scouting began the Cottage Homes came under the Christchurch Union Workhouse which stood on the site of the old hospital, but in about 1914 the name “Workhouse” was dropped in favour of “Fairmile House”. The Workhouse was administered by the Board of Guardians who according to the Christchurch Times of February 11th 1911 granted 1d a week for each boy joining the Scout Troop and agreed to spend between two and three shillings on each boy to buy his uniform and equipment. This act of generosity by the Guardians ties in with a story that tells how the Troop had no uniforms at first but for the visit of Baden-Powell to this Town in 1911 the Troop met the Founder “resplendent in new uniforms”. It is reported that in 1912 the Cottage Homes Troop was awarded the first prize of a trek cart at a Hampshire Scout Camp at Netley, to where they had marched 15 miles there and back. In 1928 under the Headquarters re-registration of Groups, Group 3415 was 2nd Christchurch (Fairmile). After 1911 there was no other mention of the 7th Christchurch and local people tell that the 2nd Christchurch (Fairmile) was the Cottage Homes Troop back in the 1920’s so it is fairly safe to assume that the 2nd and 7th Troops amalgamated soon after 1911. Over the years many Scouting events were held at the Cottage Homes, either on the “green” or in the school building, such as the District Sports, the Fitzharris Shield – for 6 Cubs from each Pack who were tested on first and second star work and the Blake Cup – a Scouts’ competition for first aid which was replaced by the Letchford Trophy. The Cottage Homes ceased to exist as a children’s home in 1952 and the Fairmile Group closed down. The Group was registered by Headquarters in 1961. They met in the old fire station in Millhams Street opposite the Congregational Church. The Group consisted of a Senior Scout Troop for boys aged 15 to 18 and a Rover Crew for young men 18 to 25. Jim Mee was Group Scoutmaster, Don Dyer was Senior Scoutmaster with 17 Senior Scouts and Ted May the Rover Leader with 5 Rovers. In 1964 John Potter took over as Senior Scoutmaster, but in 1967 the Group closed when Senior Scouts and Rovers were replaced by Venture Scouts. In 1969 the Group was replaced by the Christchurch District Venture Scout Unit, registration number 39385, with Steve Head and Pat Casey as leaders. This Unit changed its name in 1971 to Twynham Venture Scout Unit but eventually closed in 1976. Scoutlink Clubs were set up in 1986 to provide a Scouting experience for people with severe learning disabilities. The members were only affiliated to the movement as they couldn’t understand and make the promise and didn’t work for badges or awards. Christchurch Scoutlink was registered in April 1991 as the 34th Club (in the United Kingdom). They held their first meeting on April 16th 1991 with 6 members and 2 leaders, Anita Hooper and Margaret Morrison. By the end of the year they had 9 members and received a generous grant from Children in Need for some handchimes. In May 1992 the Club had a joint camp with Salisbury, their nearest Scoutlink Club. In 1995 the “Committee of the Council” agreed to full membership – making of the promise – for people in Scoutlink Clubs. The development group then had to work out how this could be implemented. On April 4th 1995 they held their 4th birthday party and invited the District to attend. It was the first time the District had been involved. A year later Anita Hooper received her Wood Badge, possibly the first for a Scoutlink Leader. The Club took part in its first community project on November 24th 1996 when they planted bulbs at Ducking Stool Lane with Christchurch in Bloom and another first in April 1997 was their attendance at the St. George’s Day Parade. On 4th March 1998 their flag, bought with money kindly donated by Burton Cubs, was blessed by the Rev. Williams and Andrew Wood invested as the Club’s first full member. On April 1st 1998 they were registered by Headquarters as 2nd Christchurch (Scout Link) and on 26th April they paraded on St. George’s Day for the first time. This Troop was registered on January 9th 1924 with W De Tolle-Swain as Scoutmaster and was apparently closed in 1927. The Headquarters Gazette for March 1911 under “New Troops 26th January 1911 to 22nd February 1911” lists this Group with 24 Scouts under Mr R Blakeborough as Scoutmaster. This is the only mention made anywhere of this Troop. “The Scouter” for August 1921 shows that a warrant was issued to Miss D French as Assistant Cubmaster. This means that the Pack, at least, was formed before that date. In 1933 the Headquarters was listed as Cranemoor House and shows the Troop as a School Troop with E Hopkinson as Scoutmaster. The next three years seemed to have been very successful, the Troop won the “Emlyn Trophy” in 1934 and 1935, they also won the “Blake Cup” in 1935 to give them both trophies at the same time and won the “Blake Cup” again in 1936. The Group continued until 1937 when it was listed in the Hampshire County Register but after that date no further mention was made. Probably the Group was closed at the start of the war. On December 7th 1967 Homefield School (Winkton Lodge) Group was registered, number 38452. There were 15 Scouts under Scoutmaster G R Allenby who later followed George Evans as District Commissioner of Christchurch. In 1969 the Group’s title was changed to that above and was then closed in 1970. This Group was registered in 1936. The Headquarters was “Rosemount” Gardner Road, Christchurch, the Rover Leader was P J Swansborough and there were 12 Rovers. The Group was closed in October 1938 when many of the Rovers joined the forces at the start of the Second World War. 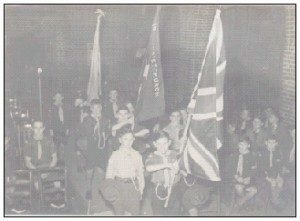 According to “The Scouter” for October 1935, a warrant was cancelled for this Group but the first Group registration on record was in October 1937 when its Headquarters was listed as “Laburnum Hut” Glenville Road, Walkford, the Scoutmaster as I Selley of “Firscot” Glenville Road and there were 15 Scouts. The last mention of the Group was early in 1939 when a warrant was issued to H White as Scoutmaster. This Group was registered in August 1938 and based in Burton, the Scoutmaster was R W Young of Neacroft, Bransgore with 16 Scouts. In December of that year Major Lake became Scoutmaster with Mr A Hutchings as Assistant. Its formation is dealt with under the 8th Christchurch (Burton). It appears to have run for the duration of the Second World War, providing Scouting during that time certainly for Burton boys and possibly for Bransgore and Sopley boys as well. The 8th Christchurch (Burton) Group was re-registered in 1946 when presumably the 13th was closed. In the Headquarters Gazette for December 1910, under “New Troops October 20th 1910 to November 28th 1910” Sopley (St Michael’s) is listed with J Lindsay Briggs of Sopley Vicarage as Scoutmaster with 9 Scouts. The Troop was again mentioned in the Headquarters Listings for August 1914 when C Vivian was given a warrant as Assistant Scoutmaster and also mentioned in the Christchurch Times in 1911, 1912 and 1913. The next mention of the Sopley Group was in 1946 so it may be assumed that the Group closed at some time probably because of the First World War. The Group was re-registered as above in January 1946, its headquarters was Sopley Old School, Scoutmaster D F London with 14 Scouts. In the 1948/49 County Register comes the first mention of a Sopley Cub Pack with Mrs Selkirk as Cubmaster. It is reported that Bransgore Scouts and Cubs combined with Sopley during the Second World War and up until the Sopley Group closed in 1952. This Cub Pack was registered on March 22nd 1948. The Headquarters was Hut 21, Site 3, Christchurch Temporary Housing Estate, Holmsley. The Cubmaster was F J Robertson with 14 Cubs. The Pack was not mentioned in the County Register for 1950 or at any time after that. On January 27th 1948 the District Commissioner Brig. General Browne attended the Pack meeting to take details for the Group registration. He also invested the first 8 Cubs. The Akela was Ron Ranford assisted by Miss Joy Wilkins. The Group was registered on 18th March 1948 as a Church of England sponsored Group, its headquarters was St George’s Church Hall, Jumpers Road and there were 12 Wolf Cubs. 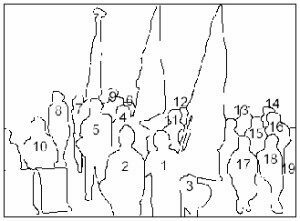 Then on November 30th 1948 the Scout Troop was started by Ron Ranford with a going up ceremony from the Pack, followed by the opening of the new Troop by “Pom” the District Scoutmaster (Mr A Pomeroy). Pom then invested the 8 ex-Cubs as Scouts. Over the years the Group experienced the highs and lows of life until on January 1st 1967 the Group amalgamated with the 3rd Christchurch (Jumpers) Group. In the 3 years prior to the amalgamation, the two groups that were situated a very short distance apart, had combined for fund raising events and the occasional camp so the boys had got to know, and accept, each other and the rivalry that had previously existed was overcome. The St George’s Group had plenty of leaders and boys but no headquarters of their own, while the Jumpers Group had a dearth of leaders and boys but a fine headquarters of their own, so amalgamation was the sensible way forward. This Group was registered on October 7th 1948, their Headquarters was the Salvation Army Headquarters, the Cubmaster Charles Palmer and there were 9 Cubs. In 1952 Charles Palmer became Scoutmaster and F J Bishop took his place as Cubmaster. The Group closed in 1954. Hurn Court was a boys boarding school and the Group was registered on February 18th 1953, their Headquarters given as the School. 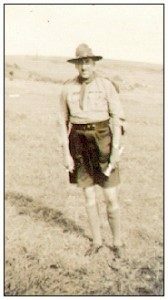 The Scoutmaster was Keith Revis and there were 14 Scouts, it was in fact a Sea Scout Troop. The Troop flourished from the start and in eighteen months they had 24 Scouts and a Senior Scout Troop. They became one of the first Founder Members of Baden Powell House in London, picking and selling mushrooms to raise the money and gain that distinction. In 1963 The Bronze Cross for Gallantry was awarded to Senior Scout H S Condy “In posthumous recognition of his great gallantry in giving his life in attempting to rescue a dog which had fallen through the thin ice in Christchurch Harbour – 26th January 1963”. The Group closed in 1969. This Group was registered on August 31st 1953, its Headquarters being the R.A.F. camp at Sopley. It was a Rover Scout Crew with 12 Rovers and the leader was Canon Charles Kirkham from Burton. The Group closed in 1957. This Group was registered on February 22nd 1956. It was a Roman Catholic Group meeting at 67 Purewell. The Scoutmaster was Roy Northam, there were 10 Scouts and 25 Cubs. The Group was closed in 1960. The Scouter for December 1922 lists two warrants issued to this Troop, to Scoutmaster C E Gee and Assistant Scoutmaster H P Lane. It is possible that the Troop was formed before 1922 and an edition of the Christchurch Times for 1912 talks of Scouts meeting during the winter in the Congregational Church Hall, Millhams Street for the purpose of rug making and other training. In August 1924 this Troop was again mentioned in The Scouter, but this was the last heard of them. Believed to have been the original name for Hurn Court. In the Christchurch Times for January 13th 1912 it was reported that 18 were enrolled at Heron Court which would cater for boys from Hurn and Holdenhurst. The Scouter for November 1920 lists warrants for this Troop issued to F W Welch as Scoutmaster and to J R Godden as Assistant Scoutmaster. The “Emlyn Trophy” came into being in 1921 and was presented for the first time to the Heron Court Troop. In September 1924 Heron Court is again mentioned in “The Scouter” with the cancellation of warrant for F W Welch. This is the last mention of the Troop. A Thorney Hill Pack was registered in 1927, Headquarters Thorney Wood, Cubmaster Mrs A Fortesque with 9 Cubs. Then it was re-registered in 1928 as shown above. In July 1930 Mrs Fortesque’s warrant was cancelled and the Group was closed. In 1952 this Group was transferred to Christchurch District from New Forest (South) District and re-titled 1st Milton. In 1953 the Group Scoutmaster was Lionel Butcher, the Scoutmaster was R Selby and the Cubmaster was Miss Gladys Rhymes assisted by Miss Amy Sque. The Group moved back to the New Forest (South) District in 1958 and changed back to its original title. In 1952 this Group was transferred to Christchurch District from New Forest (South) District. They won the Scout Shield on Sports Day in 1952 and returned to the New Forest (South) District in 1954. This information is the work of many volunteers, many many who made this heritage happen and those who have gathered the story together. Christchurch Scouts has over 200 volunteers providing scouting to over 600 young people. Building our heritage for the future.